Running webstore? 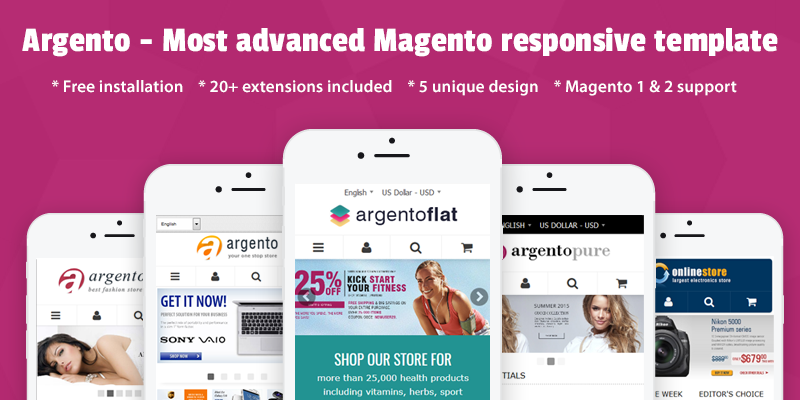 Want to get more customers in your Magento store? Check our Social Suite social media extension. It is integrated with the most popular social medias such as Facebook, Twitter, Google, Yahoo and Pinterest. 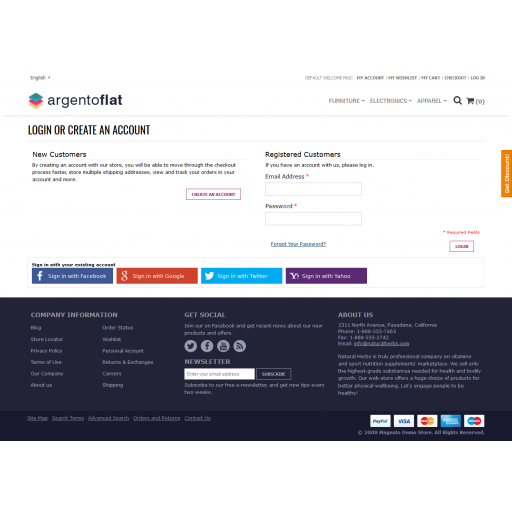 Using the extension at your Magento store, you will allow your customers to share their wishlist, orders and reviews, like your products and categories and post comments on your store products pages. Everybody is completely certain in the greatest impact of social media on the increasing of store traffic. If you’re looking the way for driving revenue, don’t forget about the power of social media on your online business. In order to boost the growing of your target audience, you’re welcome to use Social Suit magento extension. Make it the connecting link between your website and social network followers. Let your visitors make use of social share buttons. It will improve the interaction between your customers and online store. Finally it will create a social buzz around your store and increase number of social signals to search engines. Find out more information and reviews about our module at Magento Social Suite extension page. Help your customers easily create store account by using their personal account in Facebook! Using facebook login feature, your visitors will be able to login into your store via Facebook accounts and start browsing in your website more fast. 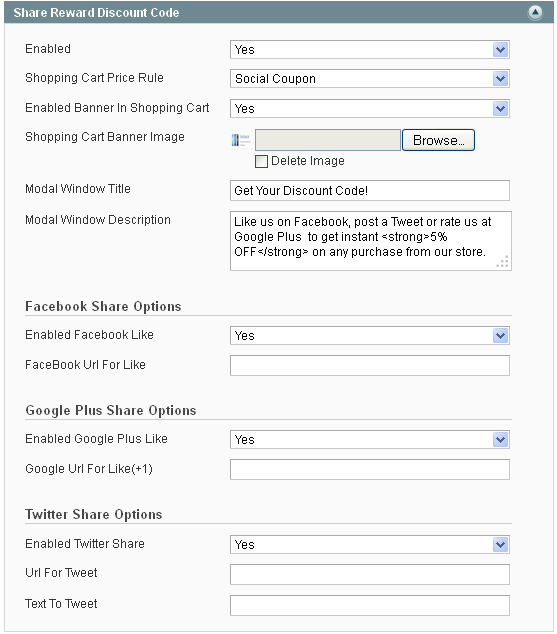 Our Magento social extension also provides the facebook share feature. Social share button placed on your store pages allows your customers to share their order, wish list or reviews about the products with their friends right from the store. Also you can set the Like button as a facebook connecting link in order to encourage shoppers to spread information about your products categories. The extension configuration provides the wide range of Like button settings such as width, font, layout style, etc. Simplify registration process in your web store by creating account with Google+ customer’s account. Let visitors log in the store using their Google account data. 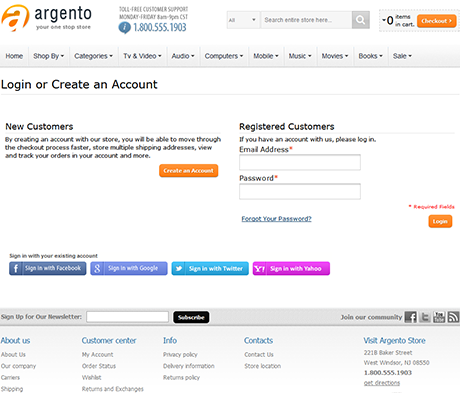 Be sure, customers will estimate the magento Google login feature especially on Fire Checkout page. In the meantime, you can set the image, that will be displayed on user page as well as on Fire Checkout page. 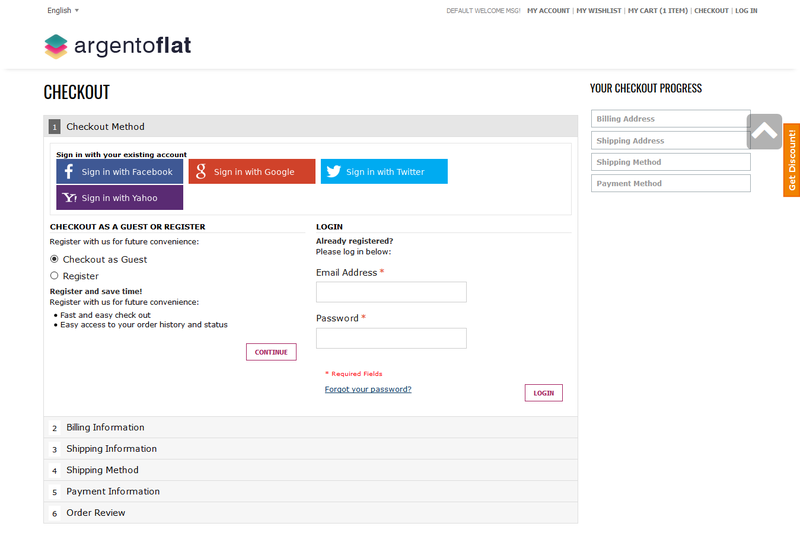 The magento Social Suite module also allows you to enable Google Plus buttons on each page of your magento store. You can configure the button size and define the display of the number of clicks of a Google+. 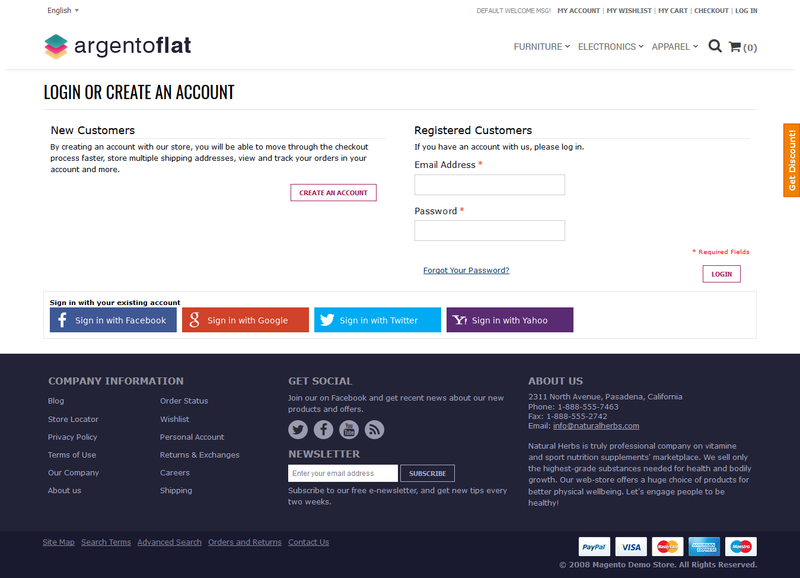 use their social network login feature on Fire Checkout page. Also you can set the image, that will be displayed on user page as well as on Fire Checkout page. Considering the fact, that Twitter is becoming more and more popular social media, let to your visitors spread information about your store by enabling Tweet button at your store pages. Also you can configure the display position of clicks on Tweet button, using Social Suit configuration. Want to add Facebook comments to your site ? You’re welcome to use the comments feature of our magento facebook extension. Thereby you can see the users’ product comments on the product page, which have been posted on Facebook account page. 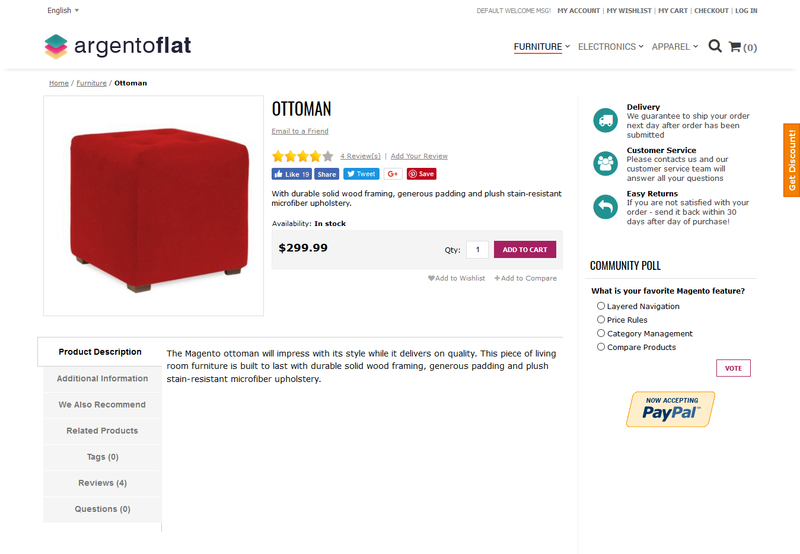 Social Suite module lets your visitors comment on the product page in your magento store using their Facebook profile picture. Just enable Use Facebook Comments setting in configuration. The module allows you to configure the width of comments’ tab, and set the number of comments that will be displayed. This magento product comment feature is a kind of transformation users’ comments into the advertisiment of your web store. In fact, when someone post a comment on the online store, that comment appears in his friends’ news feed. And everyone can use the story like the link back to your website. Let’s reward your customers for sharing news about your store via Facebook, Twitter and Google social networks. Share Reward Discount Code is great feature of our magento social media extension, that allows customers to get an instant 5% or more discount on any purchase from your store while they Like you on Facebook, post a Tweet or rate you at Google Plus. Your mobile users will be so pleased with this feature, because of Discount Modal Window responsive design. After you enable Share Reward Discount Code option at your store, your clients will make use of basic code which is used when you’re running your advertisement. 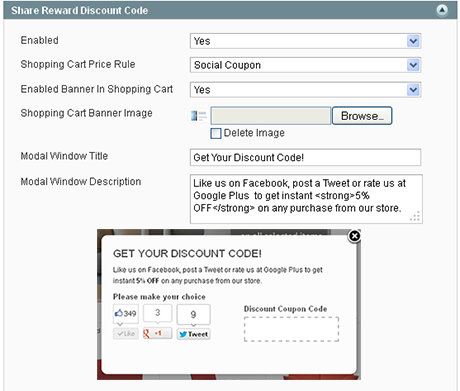 Also you can auto-generate the specified number of coupon codes for each promotion you run. Enable the Pinterest button on your store product page. It will help your customers to share product content they like with their friends via Pinterest social network. Also you can customize the style of the button on product page. Try Social Suite extension and help faithful Yahoo followers. By using Yahoo integration features, you allow customers to create an account in your magento webstore using their Yahoo account. Be sure, the Yahoo applications with their own app keys and app secret will be installed without affecting existing magento features. In order to find out how to get the yahoo App ID and App Secret key through your yahoo application, please check Social Suit user manual. We implemented Sociasuite as well as Firechekout on Magento CE v1.9.3.2 running nginx and percona 5/2017. Most of the "issues" we had involved configuring OAuth properly for the various channels. We could not be happier with the extension(s) or the support. These extensions are very well built, well maintained and well supported. I have felt like I was gambling on other extensions in the past but this implementation experience was very professional and entirely positive. I’m using several of their extensions, and there Argento template they keep them up to date and respond quickly to any issue I have with my site. I would highly recommend there products. Installed this extension myself, and it worked, needed a little help after installation, which was given quickly by the developer, in setting up my Facebook and Google API's. This has been an excellent module, which has given our store all the social networking we need at this time without overloading us with too many options, and was easy to use and set up. I have always found Temple-Masters modules very good, help has always been there if needed, and they do offer a free installation with the commercial purchased apps/extensions, if you do not want to do it yourself. Very good extension and excellent customer support. Template Master is the best when it comes to Magento extensions. They have modify Social Suit extension according to my requirements free of charge. 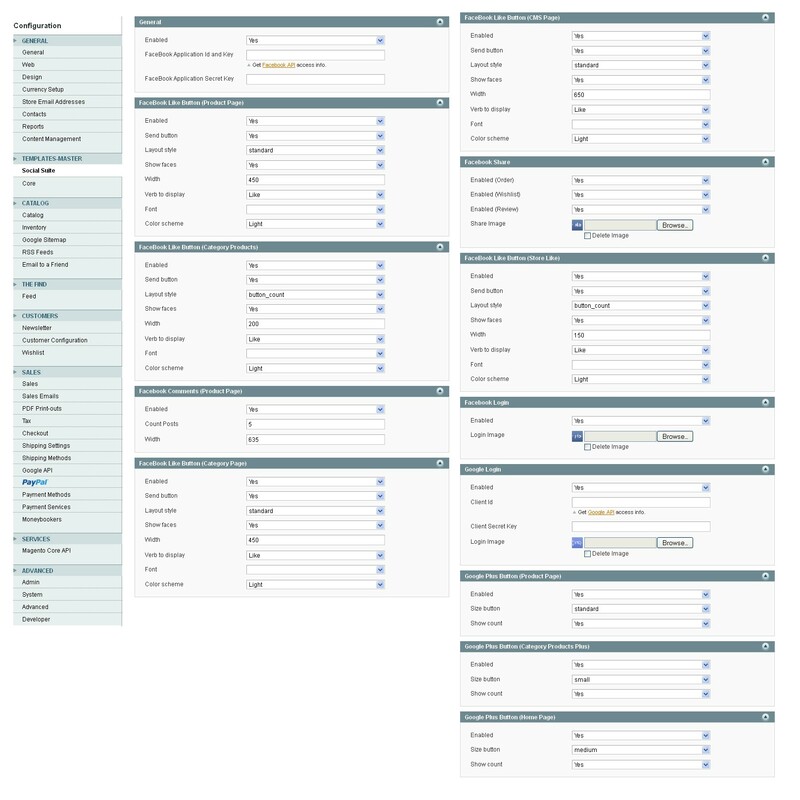 I have bought several extensions and one template from them, all of them are flawless and work exactly as advertised. Also we got updates for all the product that we've bought from TM. Great module with all possible social networks features already integrated... We had some problems with our design integration but just within a few minutes we got support and problem solved! As I sad many other times....great support, great extension. TM is magento company number ONE! Now one question....what do you thing about an upgrade for this extension with PINTERST button? I bought the Social Suite Facebook plugin. First I discovered some minor issues. The fanatic support of Templates Masters helped me out with those issues very fast and good. This extension works like a charm. I installed the free extension 'Visitors Online' from Aheadworks. This extension does not work with Magento 1.6 or newer. It works only with very old version of Magento. I contacted Aheadworks and asked them for support. They reacted that they do not support their own free extensions. Then I informed them that I am willing to pay for support. Aheadworks told me to fill in a support ticket request for that. I did that. The supporting consultant contacted me to tell me that he cannot give support for their own free extensions.... :-( Note that this customer unfriendly support is from Aheadworks. NOT from Templates Master. As I have good experiences with Templates Master, I contacted them. I asked support if they have an extension like the free Aheadworks extension Visitors Online. Or if they are willing to make one. Directly the support department of Templates Master suggested to check the Visitors Online extension of Aheadworks I had installed. I gave Templates Master support department access to my test webshop. Templates Master, thank you very very much for your help. Other organizations like Aheadworks can learn a lot from you! I really recommend the products and support of Templates Master. View all reviews for Social Suit - Facebook & Google social networks integration for Magento . Get Facebook locales from local file. 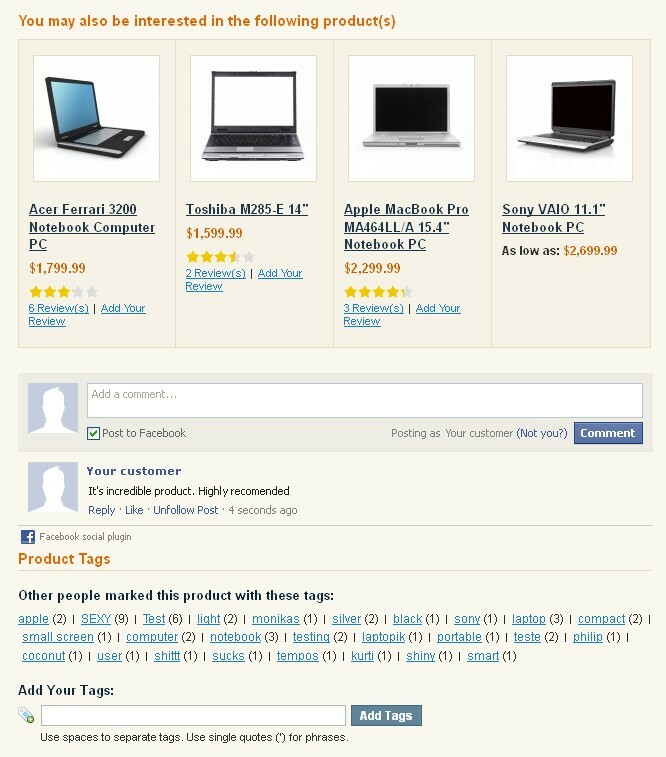 Share product review: convert html entities in product name. Please notice that extension settings will not be saved after upgrade and extension reconfiguration is required! Q: Hi,Does this extension offer Twitter Login & Twitter Feeds as well?Thanks. A: Not yet, but we are planning to add such features in next release. Q: Is it possible to call the Facebook comment box from elsewhere? I want to move the facebook comment box from under the product tabs and into a dedicated tab..
A: Yes sure it can be done. A: Do you want to place that box in easytabs block or your own theme tabs block? Q: When I click on "Like", it opened a window where I can enter my comments. However this window expands too long downward as can be seen here http://gyazo.com/5e792fdecb9ebdd3ef83b3c269e52f27, it make the "close" and "add the comment" buttons disappear. Without clicking on these buttons, the discount code will not appear. A: Please contact our support so we can further discuss that issue. Q: Why don't you implement Yahoo Login with this extension? 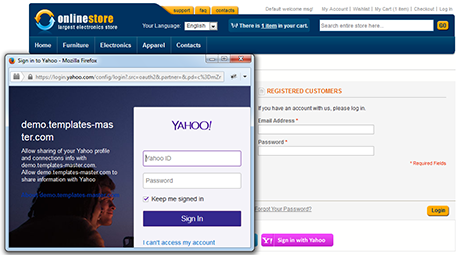 We hava customers who requires Login with Yahoo. Thank You! A: Thank you for your suggestion. Will be added in next extension release. Q: Is the discount code fixed ? Can I set different code for different customers with one-time use only. A: Is the discount code fixed ?Answer: Sorry what do you mean? In current release you can use only already created codes.Can I set different code for different customers with one-time use only.Answer: Sorry but that isn't possible in current release. Q: Does this extension fully integrate with your argento theme ? A: Yes sure, it works right out of the box with our Argento theme. A: Thank you for your suggestion. 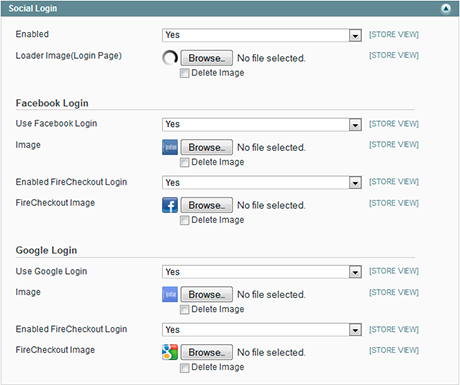 We will add that login options in next extensions releases of course. Q: Is it possible to add small icons to top menu? Right after login link. A: Yes sure it can be added with css styles. Q: Did this get any more login options added with the new release? A: We have not added any new login feature in release. We have optimised current one. But we open to ideas and can add new login interfaces. Q: I bought the social suite. I just installed and got just one problem in facebook comment on product pages, It's not showing properly. Can you assist me about it? A: Please contact us at templates-master.com/helpdesk. Our developers will be glad to help you. Q: Hi there, is there an option to choose a german version? A: Yes sure. You can change facebook locale directly from admin settings. A: to understand it correct: All texts will in the frontend be shown in german as we have german shop? A: Dear Peter, right now we made facebook widgets locale completely configurable through admin. In case you want to translate text from our module then you will need to translate small locale files. A: Dear Peter, thanks for your reply. It was very helpful. Q: Can the login screen be displayed in pop-up or with store logo header header on top? I dont feel to good about how when you click on social login you leave the store completely. A: Sorry but right now it isn't possible because facebook require to visit facebook site in order to confirm using customer personal data. Q: Can Pinterest be integrated into the share? If yes, does the image also get pinned? I looked at a similar extension by another company, and their extension has a bug not allowing the image to be pinned. Thanks! A: Thank you for your interest. We are going to add pininterest integration in next extension release. A: Do you have an estimate of when you might be able to integrate the Pinterest button? A: Already integrated in current release. A: Dear Danny , can you show us example of implementation such features. We will be glad to implement them in next extension release.